Model 5061 represents the next generation of products for the company in the field of function, pulse, and arbitrary waveform generators. These instruments are superior and far more versatile than any existing equivalent analog or digital product. 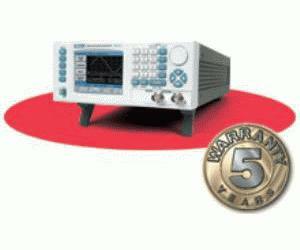 As a waveform source, this model can replace analog generators in almost every application. The instrument combines high-frequency performance, versatility, and compact size, in a boxed format. Featuring signal output in the range of 1mHz to 25MHz, 14-bit vertical DAC resolution, and up to 1M arbitrary waveform buffer, these instruments exhibit performance and provide solutions to the most demanding test stimulus challenges.